What makes real estate investment trusts unique? 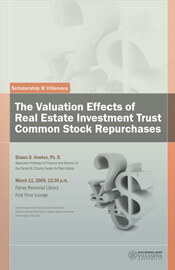 In his presentation, “The Valuation Effects of Real Estate Investment Trust (REIT) Common Stock Repurchases,” Shawn D. Howton, Ph.D., associate professor of finance, Villanova School of Business and director of the Daniel M. DiLella Center for Real Estate, will address the unique characteristics of REITs. The talk will take place on Wed., Mar. 11, from 12:30 to 2:00 p.m. in the first floor lounge of Falvey. Dr. Howton will shed light on what REIT’s are and why they make for a unique laboratory for research. He will also outline the findings of his working paper, Do REIT repurchases signal value changes in rivals? An analysis of the stock price reaction of non-repurchasing REITs. He will focus on how values are affected by open market stock repurchases for these unique firms. Not only is there an active Villanova Real Estate Society, advised by Dr. Howton, and a Real Estate minor, but there is also a lot of interest in this field around campus, according to Dr. Howton. The talk will be of special importance to anyone with an interest in commercial real estate. Dr. Howton’s presentation is part of the Scholarship @ Villanova series sponsored by Falvey this semester.